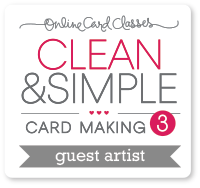 I made this card for the challenge at Moxie Fab World to make an itty bitty card. 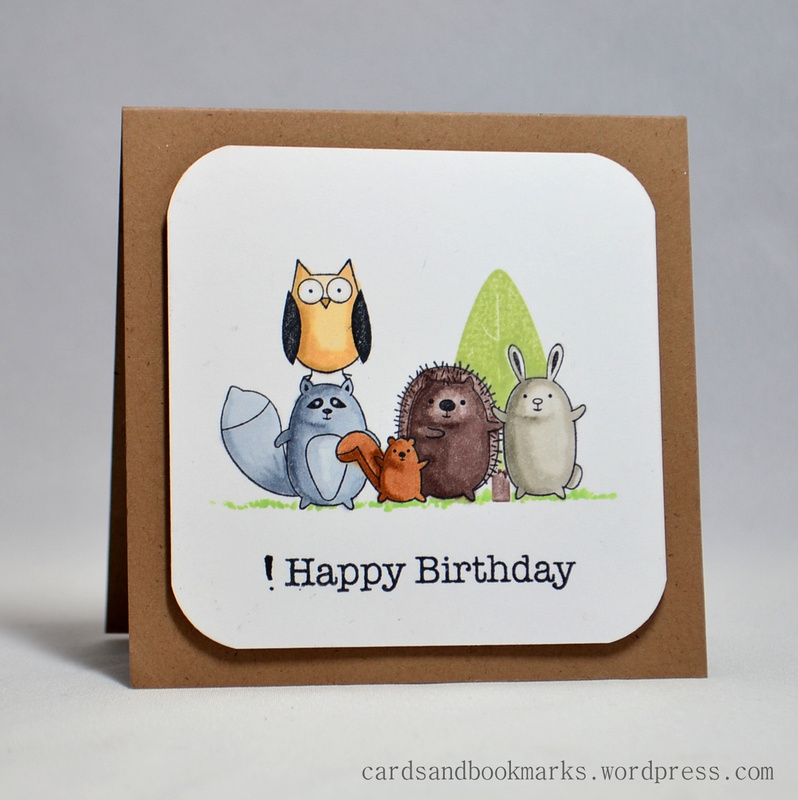 What better way to use cute little critters in a cute little card?! This card measure 3.5″ x 3.5″, and the white panel is 3″ x 3″. 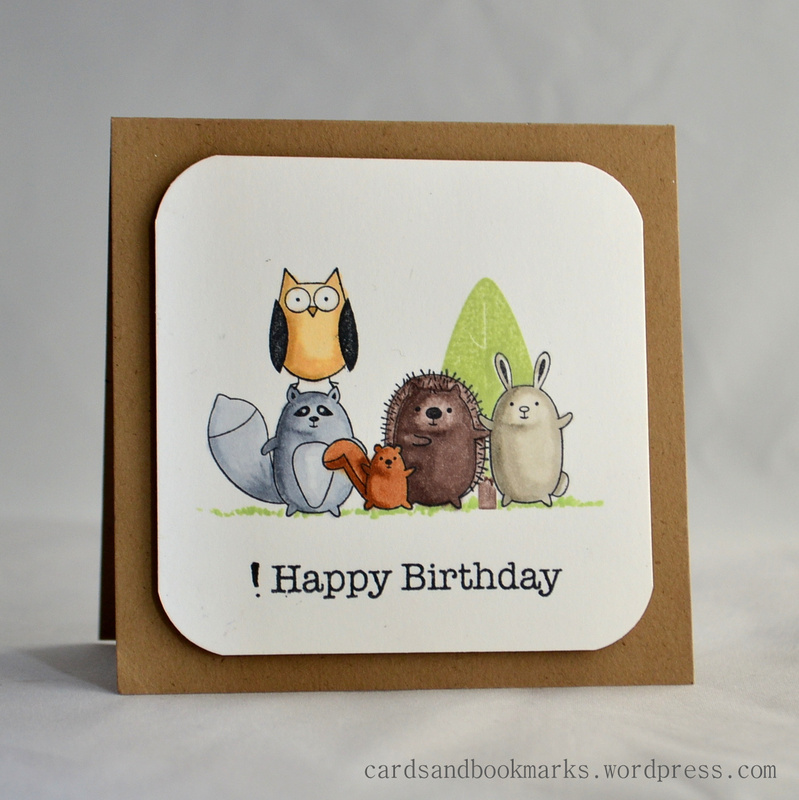 I stamped the bunny and the chipmunk first, masked them with post-it label, then stamped the hedgehog, the raccoon and the owl. I then masked the hedgehog and stamped the tree. Colored all the critters with Copic markers. I got this idea from one of Darlene’s cards. She did a video on it too, you can see it here. The first picture was taken using an OttLite. I used a photo tent in both cases. I wanted to get your opinion on which one looks better. I would be grateful if you make a comment on that! Stamp: Stampin’ Up! Furry Folk, Hero Arts All Occasion Messages. Paper: Neenah Solar White card stock, Kraft card stock. Tasnim, I think the first card looks better, somehow the card taken with natural lighting has a yellowish tint to it!! 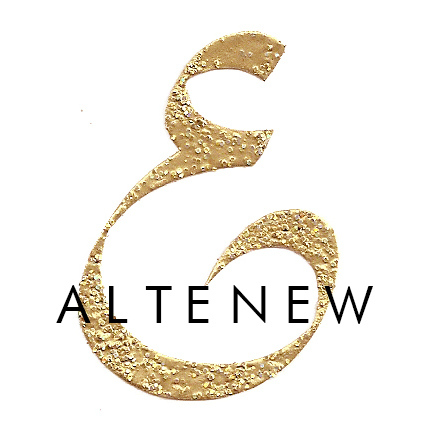 I have just recently found your site and love your creativity. Thanks for sharing your cards . I think the first photo is better, it’s brighter and the colors seem are better. This is so adorable! Love those critters! Well, I’m gonna have to go get an Ottlight because it looks really great. The second one is just slightly more yellow. Oh my! This is so cute! Definitely the first, the white is brighter. I love my ott light. Cute card, I just made a few for that challenge, hope to post them today. You might want to check about the size, I think the whole cards is not supposed to be bigger than 3×3. I love my Ott light as well. I think that the photo taken using the light is much crisper. the ottlight one is better. The first one I like better the colors seem more crisp..hope that helps. Cute! The first card is much better! This is utterly precious and adorable, Tasnim!! I am trying out various lighting myself, so I love that you posted both of these. I like the Ott better because the white looks whiter, which makes the colors look sharper, too. I am definitely going to start using my Ott light now!